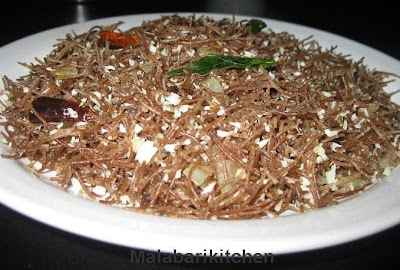 I have been taking ragi vermicelli upma as a snack after comming from school from my childhood days. I somehow did not notice it after comming to US. It was during this Deepavalli shopping that I came upon this and picked it up and made it immediatley after going home. Believe me it is very tasty and healthy and you will definitley like it. You can see other Ragi recipes like Ragiupma, Ragi puttu also. =►Soak 11/2cup of vermicelli in 2cups of water and salt. =►Drain water complteley and place it in an idly cooker. =►Staem it for 10-12min on medium flame. =►Cool it for 3-4min. Heat 1tsp of oil in a pan. =►Put mustard seeds, when it cracks add dry red chilies and curry leaves. =►Add sliced onion or shallotts into it and saute it for 3-4min. =►Then add steamed ragi vermicelli and grated coconut into it. =►Stir it for 1-2min on medium flame. =►Take this as a tea time snack. It can be also a healthy breakfast. i have started to make dishes with ragi these days taking its goodness into account. its so healthy. your vermicelli looks delicious. Ragi vermicelli sounds delicious. where you find them.